Sonia Shah is another bright star in the constellation of science speakers! Her presentation was outstanding -- she has the eye of a journalist, the mind of a scientist, and the heart of a humanitarian. ...read the book this weekend (or rather, I inhaled it). It's fascinating--elegantly written and superbly well-researched--a poignant and important reminder of malaria's relentless human toll. It was a great lecture–the kind of subject that makes us better world citizens, expands the world-view of our students–and Ms. Shah was an animated, engaging lecturer. 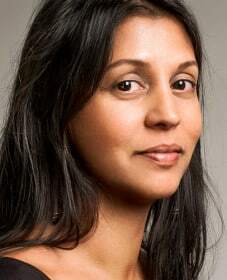 Sonia Shah is a science journalist and prize-winning author. Her writing on science, politics, and human rights has appeared in the New York Times, the Wall Street Journal, Foreign Affairs, Scientific American and elsewhere. Her work has been featured on RadioLab, Fresh Air, and TED, where her talk, “Three Reasons We Still Haven’t Gotten Rid of Malaria” has been viewed by over 900,000 people around the world. Her 2010 book, The Fever, which was called a “tour-de-force history of malaria” (New York Times), “rollicking” (Time), and “brilliant” (Wall Street Journal) was long-listed for the Royal Society’s Winton Prize. Her drug industry exposé, The Body Hunters: Testing New Drugs on the World’s Poorest Patients, has been hailed by Publishers Weekly as “a tautly argued study…a trenchant exposé…meticulously researched and packed with documentary evidence,” and as “important [and] powerful” by The New England Journal of Medicine.